This Sunday, two Chinese astronauts are expected to launch into space. Their Shenzhou 11 spacecraft will blast off from the Gobi desert and spend a couple days chasing down Tiangong-2, the country's new 10-meter-long, 3-meter-wide prototype space station. After docking, the crew is expected to remain aboard for about a month, carrying out various science experiments and technology demonstrations. Next year, in April, a Chinese cargo freighter will autonomously dock with Tiangong-2 and refuel it, similar to the way Russian Progress spacecraft are used to top off the tanks at the International Space Station. 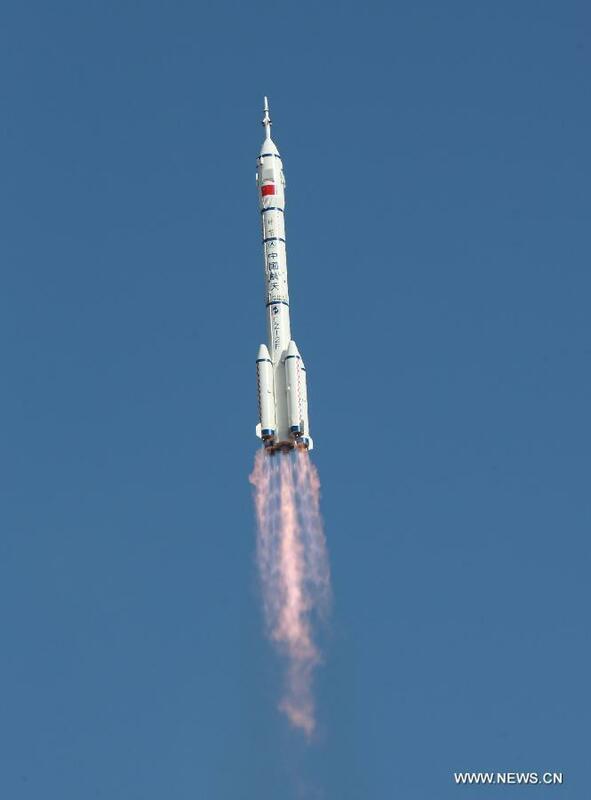 These will arguably be China's most ambitious human spaceflight missions to date. Yet when compared with the long history of similar achievements by the United States and Russia, they are modest. In the space community, we are prone to think that the pursuit of science and exploration rises above borders and politics. But in reality, China and the United States have a complicated relationship. Considering that, how should America feel about China's space ambitions? That was the subject of a recent House of Representatives space subcommittee hearing titled "Are We Losing the Space Race to China?" The title of the hearing implies the goals of the two programs are similar enough that we can even call it a race at all. What, exactly, are China's space goals? Is there really a race? And if the United States loses, is that anything to worry about? Shenzhou 10 soars into the sky atop a Long March 2F rocket, carrying Chinese astronauts Nie Haisheng, Zhang Xiaoguang and Wang Yaping. 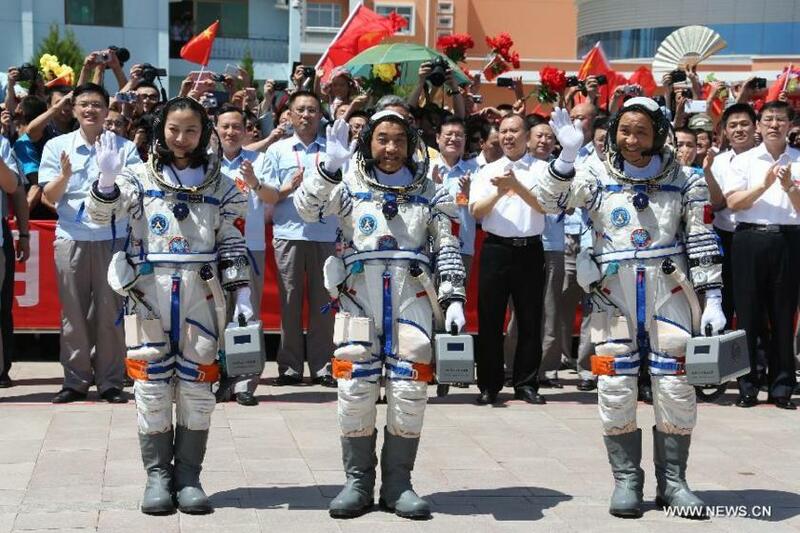 Since launching its first astronaut in 2003, China has made steady human spaceflight progress. The country's first small space station, Tiangong-1, was launched in 2011 and visited by a crew of astronauts in 2012. Both Tiangong-1 and Tiangong-2 are testbeds meant to pave the way for a more ambitious, three-module station. The first piece of that orbital complex is scheduled to be launched in 2018 atop a new rocket, the Long March 5. The station would be fully operational around 2020, and be paired with a souped-up space telescope larger than Hubble that would float nearby, giving astronauts easy access for repairs and maintenance. As for sending humans anywhere else, China's plans are vague, but reports have begun coalescing around a possible 2030 lunar landing. China's robotic spaceflight program is making even more ambitious strides. Next year, the country plans to return a sample from the far side of the moon, which would be a first for any nation. In 2018 or 2019, a lander and rover might also be sent to the far side, which would be another first, and require the country to deploy a communications relay satellite. In 2020, China hopes to send a probe and rover to Mars, which coincides with NASA's plan to send a successor to the Curiosity rover there. That rover, currently dubbed Mars 2020, will collect and cache samples for a future return mission. NASA has yet to finalize how it will retrieve those samples and get them back to Earth. China, meanwhile, is making plans of its own to launch a Mars sample return mission in 2030. As far as space exploration is concerned, then, the only common goal between NASA and China is the Mars sample return mission. Assuming a third party like SpaceX does not accelerate the process, there could truly be a scientific race to return the first sample from another planet. Aside from that, the International Space Station will remain in orbit through at least 2024, ensuring at least a four-year crossover period with China's station. Depending on the long-term fate of the ISS, there could indeed be a day when only Chinese astronauts inhabit low-Earth orbit. NASA, meanwhile, might be moving out to cislunar space by then as part of its Journey to Mars plans—assuming the next president and Congress keeps the agency on its current course. It remains an open question whether or not an international or private sector partner will step forward to work with NASA on leveraging American cislunar activities to make a final push for the surface. That could set the stage for a 2030s, return-to-the-moon international space race, where the U.S. provides a supporting role for private companies or international allies. By then, China will likely have gained the prestige of becoming the first country to operate a suite of first-time missions from the lunar farside. All told, it will be an impressive slate of achievements—but mostly in areas where the U.S. is not directly competing. Shenzhou 10 crewmembers Wang Yaping (left), Zhang Xiaoguang (center) and Nie Haisheng (right) attend a "setting out" ceremony prior to launch on June 11, 2013. Did U.S. policies accelerate China's space program? For many U.S. lawmakers, not participating in a space race may be as bad as losing one. Rep. Brian Babin, the Texas republican who chairs the House space subcommittee, opened last month's "Are We Losing the Space Race to China?" hearing with a tirade on the Obama administration, and its decision to cancel NASA's return-to-the-moon Constellation program in 2010. "This vacuum of leadership … facilitated the ascendance of China as a leading space-faring nation," Babin said. "China has capitalized on this administration's weakness by offering partnerships with other nations, like a return to the moon, which the U.S. chose to walk away from." For Babin and others, then, the rise of China's space program is coupled tightly with perceived policy missteps by the Obama administration. But China's current spaceflight aspirations, including the goal of a permanent space station, have been around much longer. And that was when the possibility of bilateral cooperation with the United States still existed; since 2011, the House of Representatives has inserted language in NASA funding bills prohibiting such a possibility. Right now, as far as the United States is concerned, China has to go it alone. Dennis Shea, who chairs the U.S.-China Economic and Security Review Commission, said during the hearing that the line between China's military and civilian space activities was much blurrier than that of the United States. "China's military controls the majority of the country's space assets and operations," Shea said. "Even apparently civilian projects such as space exploration can directly support the development of PLA (People's Liberation Army, the armed forces of China's communist party) space, counterspace and conventional capabilities." Mark Stokes, the executive director of the Project 2049 Institute, a non-profit Asia-Pacific security issues think tank, agreed. "This is part of a conscious policy referred to these days as MCF—Military Civilian Fusion, for short," he said. To what extent this is actually happening is less clear, given China's lack of transparency. But many defense experts point to the country's anti-satellite capabilities, which have been on the rise since a 2007 test that destroyed a defunct weather satellite and created a massive cloud of dangerous space debris. China has since conducted similar, debris-free, tests. Beyond military benefits, China's burgeoning space program bolsters the ruling communist party's domestic legitimacy and international prestige. Like NASA, the program also supports spinoff technologies, which improves China's ability to compete in the global commercial space market. All of that is beneficial to the country's economy, said Dean Cheng, a senior research fellow at the conservative Heritage Foundation's Asian Studies Center. "The Chinese see an advancing space capability almost like a locomotive that will pull along other parts of the Chinese economy," he said. Tensions between the U.S. and China certainly exist. And China continues to be make worldwide watch lists for human rights violations. But the narrative that the two countries are engaged in a space race akin to that of the U.S. and former Soviet Union does not entirely fit. Why, then, do some American lawmakers consider China's space ambitions such a threat? According to Cheng, the real answer might lie in the fact that for almost half a century, the U.S. has stood alone in being able to claim the most prestigious feat of all time: landing people on another world and returning them safely to Earth. "The reality is, the day the Chinese are able to [land humans on the moon] is the day that American uniqueness will be openly challenged," Cheng said. "And Chinese prestige will be placed on the same level as that of the United States." In the early days of TPS, we advocated for cooperation in space between the USA and the (then) Soviet Union. The ISS is an example of what such cooperation can achieve. Imagine the possibilities if the USA and China (and Russia, the Europeans, etc.) worked together. The TPS could be a voice to start the conversation to make this happen. We were that voice in the past. Why aren't we now? Lets just be clear, China is advancing some component technologies here that US has never had, such as refueling large spacecraft on orbit. Similarly, components of Chang'e lunar probes have had technological bits that are ahead of what US has yet put to space, such as vision guided landing. It is a mistake to assume that China is substantially behind technologically in space, and they certainly are iterating on these technologies at sustainable cadence. I believe China's taking a different approach from either the USA or the Soviet Union. It seems to be going, overall, "slow-and-steady" while doing minor goals the USA neglected to try, such as landing on the Far Side of the Moon. I don't think they would risk their crews to land anywhere yet, but I could see them attempting Mars Sample Return before anything can retrieve the Mars 2020 Rover's caches if they truly wanted to beat NASA. What makes them scary is they may be smarter than the Soviets and more unified than NASA. countless permanent stations over premium lunar terrain, it becomes a case of too little, too late - restoring NASA at that point does nothing unless we wish to quite literally remove their grip on the moon by doing away with their sprawling lunar infrastructure. We must restore NASA's independent human spaceflight quickly so that, at the very least, one other nation has both the legitimacy and ability to confront China's imminent grab at lunar riches. Ideally we should also hope to somewhat emulate China's lunar aspirations, opening up the vast supply of resources that exist to improve the quality of all lives while guaranteeing that no one nation may lay claim to them. Rather, we should aim to achieve the multilateral effort behind the ISS, working to promote a cooperative endeavor and ensure openness and equality in space, healthy economic competition for missions, and that the resources found therein and their monetary value are shared with all who would join in the effort to acquire them instead of becoming sources of new conflicts between nations. In this day and age, few issues are as economically, technologically, scientifically and politically beneficial; bipartisan and uniting by being something we all take pride in and are in awe of; and promote such an educated, skilled and successful workforce, as does the exploration of outer space. All the better that China's goals might make larger numbers aware of the vast supplies of natural resources waiting for us that will improve lives across our entire planet, guaranteeing that our grandchildren will not suffer for our excesses in depleting the Earth's supply of many vital components to modern day - and future - living. by: Mapping the moon, determining where caches of natural resource were, the danger of solar radioactivity between Earth and the Moon for future human missions. Most vital of all, they specifically sought out Helium-3. This has absolutely no logical purpose other than if one were intending to determine the potential for natural resource extraction. So we have the entirety of China's first real push in space with the Chang'e program entirely concerned with natural resources. Purely selfless scientific goals weren't just secondary, they didn't exist at all. This was followed up with the recent Chang'e 3 lunar rover, Yutu. The stated goals of that mission are as follows: 1) To develop knowledge and technologies for lunar landings. 2) Lunar surface topography/mapping. 3) Geological survey of the Moon. 4) Lunar surface material composition and *resource survey*. 5) Perform first ever direct measurement of structure and depth of the lunar soil as far down as 100 feet. 6) Investigate lunar crust structure and composition down to 1-2,000 feet. *This is a mission irrefutably designed with a singular purpose as a potential mining survey. Had this mission occurred on Earth, the objective would be undeniable in determining essential data prior to extracting natural resources. *A second rover, essentially a back-up and twin to Yutu, launches in 2015 to scout a secondary location for lunar resources. *Finally, Chang'e 5 will fly in 2017 and return with drilled samples of lunar soil. 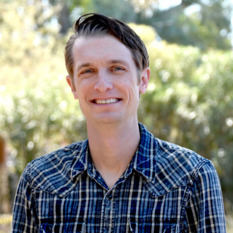 The probe will most likely land in a resource rich area, acquiring and returning with a sample to study extensively in laboratories to detect the resources available near the surface, their abundance and quality, resulting in a better determination of the practicality of mining lunar terrain as well as the technologies and capabilities required for doing so effectively. *China will have a permanent space station in the next six years, by 2020, developed and launched entirely on their own. An orbiting habitat is an essential part of lunar and asteroidal mining by serving as a gateway and control center, both for setting up & running resource extraction sites as well as facilitating their transfer back to Earth. Meanwhile, our last comparable independent attempt at an orbiting station came in the 1970s with the Skylab program. Even factoring in the ISS, currently our lone endeavor with human spaceflight, only has funding to last until 2020 - if (and it is a very big if) we and our partners can agree to an extension, the hardware itself can remain operational only through 2028 at the absolute latest. End of mission will see it brought to a controlled descent over the Pacific - an irreversible decision with whatever isn't vaporized during atmospheric reentry plunging to the depths of the ocean floor. *A proposed Chinese mission includes an impactor to study intentionally redirecting asteroids and comets; although initially it might appear benign as a means of protecting Earth from future meteor impacts, the capability to move asteroids into stable orbits near Earth or the Moon is universally agreed to be a critical step in mining those celestial bodies, minimizing the distance necessary to transport infrastructure from and extracted resources back to the Earth. I just happened to be reading another article... please tell me this quote isn't true or accurate: http://www.washingtontimes.com/news/2016/oct/16/nasas-mars-mission-on-standby-for-next-president/ "“In a sense, it’s disappointing that science and space science and space exploration isn’t a bigger issue, but at the same time, it’s kind of a good thing that one side isn’t talking about it and riling up, creating division between it by embracing it,” said Casey Dreier, director of Space Policy at the Planetary Society." Do I 'get' the idea behind it? Maybe. And look, I've always felt Mr. Dreier was good at the work he does for the Society. No employee of TPS should be expressing to the media that our leaders ignoring all things NASA, and NASA dying as a result, is really a *GOOD! * thing. That's just so wrong I don't even know where to begin. Just... wow.